If you’re wandering along one day and you find a wooden pallet (there’s plenty floating around) and you’re feeling creative, you should try making a pallet garden. They don’t take up too much space and are a nice way of gardening up, especially if you have little people and want to have accessible things like strawberries growing out – yum! Last chance to get in for Barbara’s next workshop on garden planning and soils/composting, more information on the fabulous Antwalk up O’Connor Ridge, and tomato seedling sale that you should definitely get in on. DB Spring Excursion Calendar Excursion: Antwalk! Did you know for example that ants started harvesting resources to use as compost for the cultivation of fungal gardens more than 50 million years ago? And that Australia has over 1500 species of ant? That Canberra houses more ant species than the British Isles? Ants occupy almost every corner of the planet with the exception of Antarctica and a few islands. ANU ant biologist Chloe Raderschall has been studying navigation in nocturnal bull ants, seeking to understand how they use visual landmarks and the sky to navigate between food sources and their nest, what sensory adaptations they need to see in dim light and how their brain processes this information. 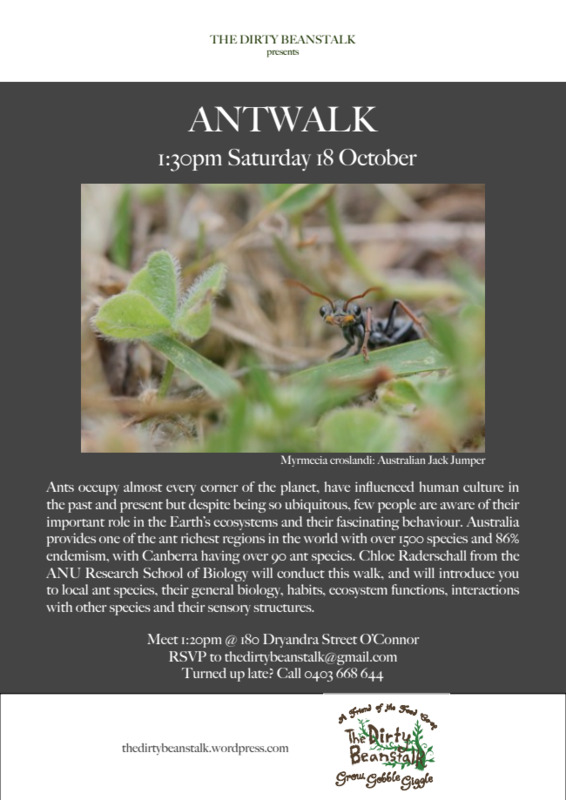 She will take you on a wonderful journey up in local bushlands to explore the life of ants. More info in flyer – suitable for children. Please wear enclosed shoes, and if you have a hand lens bring it along. RSVP by Thursday 16 October. Barbara will be looking at the physical aspect of gardens and at soil health – two very important factors in growing good vegies. Still accepting people although we’re nearly full. Email for payment details and to confirm your place. The fine tomato growers of the Merici Sustainability Program are selling the products of their hard work! An amazing variety of seedlings will be available, including Black Krim, Green Zebra, Tigerella and Cherry tomatoes – at the unbeatable price of 4 for $10. Go get your spring gardening on! Come help us pack summer varieties – skipping a fortnight in here to allow for exam period (we’re all hardworking students). This lovely educational garden by the lake makes for a great place to spend an hour or two on a sunny Saturdaymorning. Check the facebook page for updates. Next working bee will be this Saturday 18th October. Last Saturday didn’t have any plants to put in in the end, so it’ll be happening Saturday week. If you’re interested in input on what goes in or want to know more, send us an email and we’ll put you in touch with lovely coordinator Sara. The Rooftop Garden grows herbs and some vegies in the difficult micro-climate up there in the wind and heat. Great for sunny days, come help and take some produce home. If you know how to build stuff, CCF want to hear from you! Help is needed with construction of the new temporary site in Turner, which is a very exciting stage to be involved in – setting up the hub that the city farm will be! Email them at canberracityfarm@gmail.com. Still nobody has volunteered for this 😦 Would be great for next year! There’s a great Pedal Powered Cinema we have access to at the co-op (some of you will be acquainted with it already), and of course there’s many, many wonderful garden and earth-health related films out there, which we’d love to show! If you’re an organising person who loves films and plants and has some time to invest, we want to hear from you! Can be short or long term, email us for details. Natural Sequence Farming (NSF) is this interesting little theory on a way of farming developed by (somewhat controversial) Aussie farmer Peter Andrews. The idea is to rehydrate degraded landscapes in a way that works with nature not against it by reconstructing natural flows within waterways, instead of something like irrigation. Australian Story has done a show on Peter Andrews and he’s written a couple of books. It’s great for larger-scale farming, it’s not really an urban agriculture thing, but it’s very interesting for our hinterland close-by, our food bowl. Different people are trying it, it’s made its mark on Australian agriculture, and it’s another voice questioning how food is produced – just how do we get past intensive production to healthy productive landscapes? Ever wanted to know more about ants? Please email us to reserve your place and get details – payment is required by Friday 10 October. We may accept people after this date, but we need numbers to go ahead, so if you’re interested please contact us asap – have had lots of interest but not many payments so far. Have you ever seen red brussels sprouts? Do you even like brussels sprouts? They’ve been grown in Belgium (well Brussels) since 1200. Now’s the time to grow them in Canberra, and find out if your taste buds are partial to them (hint: they’re for sale at the Co-op)! The red variety have a milder, nuttier flavour than their normal green counterpart, as well as being full of antioxidants, vitamins C & D and folic acid… and are easy to cook. Last chance to get in for Barbara’s next workshop on garden planning and soils/composting, more information on the fabulous Antwalk up O’Connor Ridge, and volunteering opportunities. 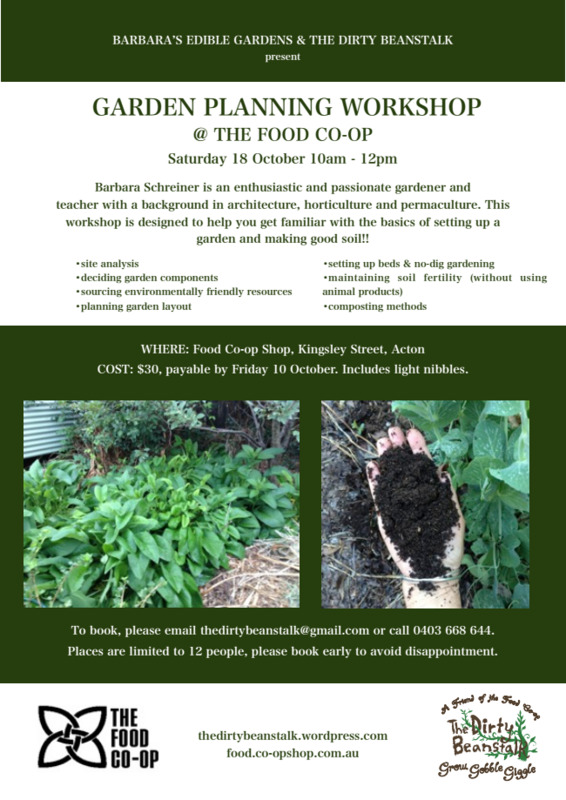 Barbara will be looking at the physical aspect of gardens and at soil health – two very important factors in growing good vegies.Please email us to reserve your place and get details – payment is required by Friday 10 October. We may accept people after this date, but we need numbers to go ahead, so if you’re interested please contact us asap – have had lots of interest but not many payments so far. So there’s this great Pedal Powered Cinema we have access to at the co-op (some of you will be acquainted with it already), and of course there’s many, many wonderful garden and earth-health related films out there, which we’d love to show! If you’re an organising person who loves films and plants and has some time to invest, we want to hear from you! Can be short or long term, email us for details. Guerilla gardening may be back. Email us your phone number to go on our very secret list, we’ll text you when there’s action. Our lovely blogger Saaro still needs a few more people to practice massage on for a course! Thanks to those who have already volunteered – if you’re interested send us an email and we’ll put you in touch. There isn’t one. But you can spend lots of time checking out this awesome website which is full of fascinating information on every type of plant that ever there was. There’ll be more last words next week. This weekend marked the first of our spring excursions and we could not have asked for a better start to the series of events planned for this season. 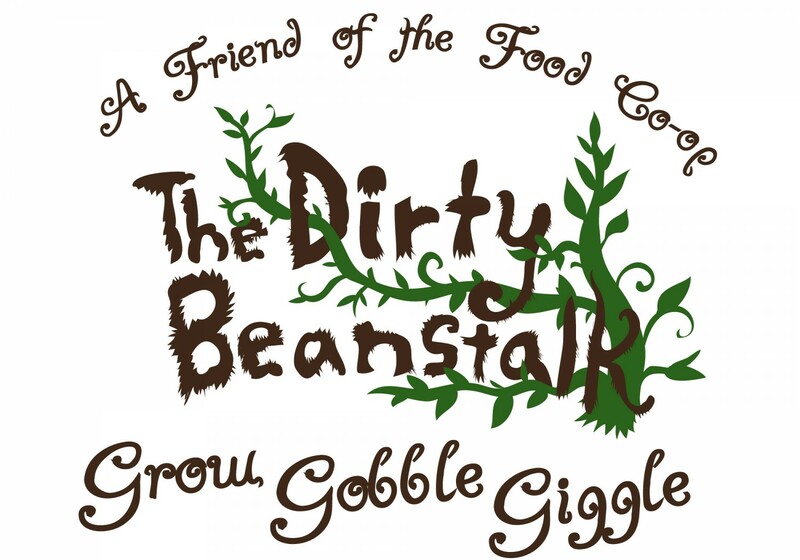 We began close to home in the perfect spring Saturday sun – starting where the roots of The Dirty Beanstalk lay (quite literally!) with a tour of our rooftop garden. It was truly a pleasure to be joined by such a delightful bunch of first-time visitors at this enchanting piece of urban agriculture nestled atop the Food Co-op building. There were some keen growers/gardeners amongst the group who undoubtedly held a wealth of knowledge and strong commitment to growing food in the most natural ways possible. Although just as importantly there were also those with a keen interest in learning more, with everyone sharing in the chance to see an inner-city growing space in action. A lot of the discussion focussed on how the soil and plants cope in a rooftop micro-climate often exposed to harsh winds, heat, and potential frost. Brendan talked us through his strategies and gave us a close-up look at his mulching, composting, and watering techniques. For now at least, everything is looking mighty healthy up there! Some of the highlights included hearing about Peter’s experiments with wood chips in his home composting system (apparently the worms love it! ), and Break O’ Day Farm’s John and Vicki describing their revegetation work (and own battles with frost and water restrictions) on their land in Gundaroo. Lastly, what a pleasure it was to witness the excitement and curiosity our youngest visitor Clover displays towards growing food and also find out about her school Kitchen Garden. In summary, there were no mistakes for this group that it is all about sun, soil and water – the key elements for not only growing our food but for all life, and through our visitors and resident Beanstalker’s coming together we all created the opportunity to grow a bit of community as well! So, thank you again to everyone involved in making our first excursion extremely enjoyable, full of good company and interesting discussion. We welcome anyone and encourage everyone to join the weekly opportunity to help out/hang out in the garden on Saturday’s from 11 to 1pm. Also, be sure to keep an eye out for fresh chemical-free produce from both the rooftop and Break O’ Day Farm regularly available at the Food Co-op. Finally, stay tuned as we head further afield for more adventures of the season! If you’re looking for something special to grow this summer, why not try Turkish Orange Eggplants? Apparently they originated in Africa, albeit Turkish in name, and are small, sweet and have a prolific yield. We have some packs at the Food Co-op so come on down and get experimenting! Lots of exciting news this week, including Barbara’s next workshop on garden planning and soils/composting, our Rooftop Garden Tour THIS SATURDAY (!!) and free massage! We have another one! Last one was a great success, thanks to all who came and demanded more. This time Barbara will be looking at the physical aspect of gardens and at soil health – two very important factors in growing good vegies. Please email us to reserve your place and get details – payment is required by Friday 10 October. First excursion: Rooftop Garden Tour @ Lena Karmel Lodge (Food Co-op building). 12pm, Saturday 4 October. No RSVP necessary, meet in the co-op at 11:55pm, 3 Kingsley Street Acton (flyer attached). Up next: Antwalk! 1:30pm, Saturday 18 October @ O’Connor Ridge. More details next week. Next working bee will be this Saturday 4th October, going to be doing a bunch of planting with new seedlings so come on down! Our lovely blogger Saaro needs people to practice massage on for a course! If you’re interested send us an email and we’ll put you in touch. The Australian permaculture scene is a happening place. The brainchild of Australians Bill Mollison and David Holmgren, permaculture is a (continually evolving) system where agriculture, design, economics, ethics and other elements are considered as integral elements to productive, sustainable lifestyles. To get into learning about permaculture, there’s heaps of books and info online, but a great way is to access one of the many courses around – the standard course being the Permaculture Design Course (PDC), offered at a variety of places including Milkwood,Permaculture College Australia, the Permaculture Research Institute and truly, the list goes on, there are places EVERYWHERE. In Canberra, there’s lots happening too. There’s the Permaculture Exchange, who run courses frequently including the up-and-coming Introduction to Permaculture course at the end of November; Permablitz use permaculture principles and focus on getting unused space (maybe in your back/front garden!) into productive edibles land. Well hasn’t the weather been gorgeous – hope your frost-sensitive seeds have been punneted, and the sun has given you inspiration! If not, there’s still time… otherwise, for non-frost sensitive vegies, pop in some beetroot, celery or leeks. We have lots of exciting news this week – the beginning of the spring excursions calendar, back at last, talks at Floriade, and most importantly, seed packing! Also, we have another of Barbara’s fantastic workshops on, so if you’re keen check it out and send us an email. This week we need lots of helpers! Come help us lovingly package the life that goes in the ground – come for the whole time or come for a bit (and take home some seeds). Please email us to reserve your place – payment is required by Friday 10 October. Brought to you by the Environment Centre, this event comprises of three knowledgeable speakers who are going to talk about soil, health and food. It’s on this Thursday, so book your tickets here: it’s free!! First excursion: Rooftop Garden Tour @ Lena Karmel Lodge (Food Co-op building). 12pm, Saturday 4 October. No RSVP necessary, meet in the co-op at 11:55pm, 3 Kingsley Street Acton. Thanks to everyone who helped last Saturday – the bed’s looking clean and beautiful. Next working bee will be onSaturday 4th October, might even do some planting! If anyone is interested in making their own kombucha, the tasty, fermented ‘miracle fungus’ drink your guts will love, DBer Rodney has offered to give a free scoby to anyone who is keen to try their hand at it. Contact him at rodney_martin2006 at yahoo dot com dot au. We also have another member, Sadie, who is making lots of milk kefir and has offered it for free (maybe in exchange for something else yummy!) to anyone who might be interested. Contact her on u4469589 at anu dot edu dot au. Weeds, perhaps the most underrated and under-utilised plants around! Many of these plants we see as pesky annoying invaders of our gardens are actually tasty, free, and sometimes medicinally useful greens! And of course, there’s lots of them. This great article on edible weeds calls them the ‘rock stars of the plant world… they live fast, procreate a lot and die fast’. Because of that, they tend to not spend much energy on producing toxins (mostly), and also have to harvest nutrients, often from poor soils, making them hardy and nutrient rich. Ribwort, for example, a common weed in Canberra, is high in selenium and calcium! Or dandelion, which has a million medicinal uses. You can even make liquid fertiliser from weeds. Get out there and start harvesting your new friends! Thanks to all who made it along to the Meaningful Movies screening of Dirt! at the Pedal Powered Cinema last week, it was a great night. Also for anyone wanting to come along to this week’s seed packing, it’s been changed from Thursday to Tuesday, sorry to change, hope you can still make it! Barbara will be sharing her knowledge on all things for seeds, sprouts, seedling survival, and preparing you for a great harvest! Places have filled for this workshop, but if you’re still interested we have decided to take more people still and run a second workshop if we get numbers. Email us to get details. A series of talks centring around local, sustainable food production will be held on Wednesday nights in September, asking all the questions (and maybe giving answers) to everything Canberra urban agriculture related. Book tickets to one or the whole series here. It’s coming back! We’ll be doing excursions to exciting gardens and garden-related places on a few Saturday afternoons this spring, watch this space. This lovely educational garden by the lake makes for a great place to spend an hour or two on a sunny Saturday morning. Check the facebook page for updates. UAA really need volunteers right about now, Floriade starts this week! So if you were thinking about signing up, now is the time. Fill out the survey and get on board! Lyneham Commons is a community gardening project happening in the inner north, and it’s happening! Concerned about peak oil, food security and sovereignty and sustainability, the Commons are tackling these issues in the most local way – by encroaching on previously unused land to grow food. Check out their blog and Facebook page here. Universities, as a microcosm of the city around, are great experimenting grounds for sustainability. Indeed many universities around the world have ‘green campus’ sustainability programs, and the sustainability rankings of universities are becoming many! Both Tufts University in the US and Universitas Indonesia have developed sustainability meters for universities. University green offices are springing up in all kinds of places, such as South Africa and Ecuador, and apparently, all over Australia. There are networks like the the Australasian Campuses Towards Sustainability, and almost every campus seems to have a sustainability office, ACU, Adelaide, UQ and Macquarie to mention a few. Of course, ANU is known to have a very good green office at ANUgreen, who work on energy efficiency, student outreach and behavioural change. Go universities! Next they just have to get all their investments out of fossil fuels, source good food and support their community gardens, and set to go. Come help us lovingly package the life that goes in the ground – come for the whole time or come for a bit (and take home some seeds). Roundhouses are an ancient building method dating back to as early as the Bronze Age. These structures are quick, easy and cheap to set up and are a perfect building option to create a guest room, shed space or a studio. This workshop will be lead by Dan Harris-Pascal who has studied natural building and Bio-construction in Australia, New Zealand and Chile. The wattle and daub roundhouse emerged by blending a range of natural building techniques. Please see flyer for more details. Amnesty Canberra are holding monthly movies at the Food Co-op on the first Tuesday or each month, and in September DB is hosting!! Yay! We’re going to be showing a film about our favourite thing in the whole world, soil. Dirt! The Movie tells the story of soil and its importance and challenges to its good management and survival. The film will be followed by a short talk by ANU academic Dr John Field. Tea and nibblies provided, RSVP not essential but appreciated. This is kicking off Saturday week alongside the regular SLC Garden working bee Saturday week, will involve cleaning up the bed, starting to plan and seeing what’s there! No RSVP necessary. Places are going quickly for this workshop, email or call us to reserve your place and get payment details. UAA are once again doing an exploratory pathways display at Canberra’s annual flower festival, Floriade. This exciting initiative puts food production into this massive festival, and there are plenty of opportunities to help out! Floriade is held 13 September – 12 October, but there are opportunities to volunteer before and after. Fill out the survey and get on board! What happens with food production in areas torn by war, occupation or natural disaster? Agriculture can help people to have control over something again, save money, give fresh healthy food to their family, and maybe even make a small income from selling excess. In the Gaza Strip, an export-oriented market has created food pressures for the densely-populated, arid piece of land, and a resultant lean towards urban agriculture has followed. For women, who in many places cannot move out of a domestic setting, agriculture can be an empowering activity, as this project taking placing in a Palestinian refugee camp in Lebanon shows. Post-earthquake Haiti has had to grow food in urban settings to supplement food supply, much from the UN. Another take on agriculture on this topic is about compassionate farming, which the film Sustainability in Exile shows in under half an hour. It’s about sustainable agriculture and permaculture projects in four refugee camps, and mixes economy, spirituality and gardens. Time to start getting ready for spring! It’s ‘officially’ spring in exactly two weeks time, so start thinking about punneting in the joy of the warm weather – artichokes, beetroot, melons, even zucchini, capsicum and tomato can be started early. Check out COGS (Canberra Organic Growers Society) planting calendar and growing guides, they’re a valuable resource in our temperate climate! This week we’ve got some good events in the making, including a spring gardening workshop in September for anyone looking to improve their gardening knowledge. Now with a new date, this workshop will *almost* definitely run! The amazing Barbara will be sharing her knowledge on all things for seeds, sprouts, seedling survival, and preparing you for a great harvest! Places are limited to 12 people to book early… email us to confirm your place and get payment details. We’re going to start sprucing up the natives demonstration bed in the next few weeks, if you’re interested and want to be involved, send us an email and we’ll give you deets. Landscape restoration is something the world really needs right now, especially in food-producing lands. John D. Liu, a Chinese-American who decided to become a soil scientist, has taken restorative practices to many degraded landscapes around the planet, including windswept plateaus and desertified areas. Considering he’s also a film-maker, his work is quite interesting!